There are dozens of crime thrillers that reach the marketplace every year. Most of them are forgettable, sometimes there is a prestigious director or novel behind the film, but it takes something unique to pull me into a theater to see those films. The small ones usually slip by and that is sometimes unfortunate because there might be something worthy in them that I just don't know about. I still need to catch up with "Sicario" from two years ago, a film that was written by the writer/director of this movie. I did see "Hell or High Water" the most recent of Taylor Sheridan's screenplays to get made intro a film. It was my favorite film of last year, a position it took over the more I watched it. 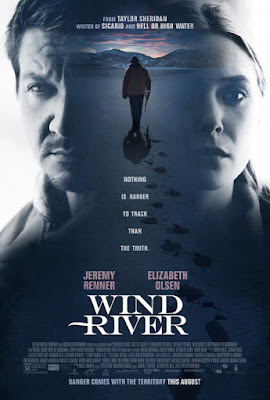 That film is the first reason I drove the 35 miles down to Hollywood to see "Wind River". A second reason I was intrigued by the film is that it is set in a location that I have visited frequently over the last few years. Lander, Wyoming is a small town in the middle of the state, it is surrounded by the Wind River Indian Reservation. While I have been to the two tribal casinos in the area, I have no first hand experience with life on a reservation, and the problems that the native American populations have to face. One of my friends who lives in Lander does know something of this because the school program she is a director for has numerous children from the reservations attending. They often come from homes where there are drug problems. My contact is superficial but I do know the terrain a bit, and even though my visits have all been in comfortable weather, I can see how the desolate areas can be foreboding in the chill of a snowstorm or long winter. I have often said to my friends when we visit, that their home in in the middle of nowhere, and you'd have to drive two hours to find a location that you can see somewhere from. With that background, let's talk about the story briefly and consider some of the themes that it presents. A young woman is running a best she can through the night, in the cold of Wyoming near the end of Winter. Her body is discovered by a Department of Fish and Wildlife hunter, who works eliminating predators which threaten the agricultural industry from the area. Jeremy Renner is a face people know, he is an accomplished actor and has some star power that he brings to the film. It may be that because he has been in the "Avengers" films, people forget what a fine actor he really is. He was solid in last year's "Arrival", but Amy Adams was the star of that film. In this movie he is extraordinary playing a man who is fairly ordinary, except for the job he does so well. The part also starts us at one of the points this film is making. It is hard to get some things done when you have multiple governmental agencies involved and the jurisdictional questions sometimes seem to outnumber the real problems that people face. The County Law Enforcement Agency is limited because the woman who died was found on the Indian territory. This makes it a Tribal Police matter, but there are Federal Crimes that might be involved as well and those help bring in FBI Agent Jane Banner, played by Elizabeth Olsen. Olsen is also a veteran of the MCU, and she is relatively young which cuts two ways. Her youth suggests limited experience, a complaint about the Federal help the Tribal police get. Her young age also strains credulity somewhat, since it seems she might not come across as the kind of person to be a special agent in charge. If I have a criticism of the film, it is the way in which her character has been written. She is out of her depth and makes significant mistakes, which basically repeat twice in the course of the investigation. It is also her attitude about the circumstances that provides heart to the story. She reacts to events they way many of us outsiders might; with confusion, pity and a sense of frustration. The procedural elements of the story are not complex and the effort to track down the perpetrators does benefit from Renner's character's expertise at tracking in the desolate countryside. The mismatched and slightly awkward partnership is found in a thousand of these crime based films. This however is not really a "buddy cop" movie. The point of the story concerns the lack of control that any of the characters face in an official capacity contrasted to the degree of control they have in their professional expertise. Jane banner is limited by Federal guidelines, Graham Green who plays the Tribal Police Chief is constrained by the jurisdiction of the Reservation, even the medical examiner is limited in how a death report can be summarized. The environment has clearly created the situation where a death such as the victim faced, might not ever get an answer. The frigid open spaces and narrow bureaucratic red tape ultimately is going to be conquered by Renner, the one person who is not a law enforcement agent. Cory Lambert, Renner's character, does have his own motivations for helping out, and those parts of his back story are a couple of the spots where his acting skills get a chance to shine. If you want tension and action, let me tell you there are two excellent sequences that have plenty of the violence and brutality that you seek. There is also a scene that explains what happened which is cleverly inserted as a non-sequential insert at just the right spot, be forewarned though, it is unpleasant to witness. Olsen's character may have some flaws as written, but the emotions she reflects are just right. Her ability to empathize with the victims and her recognition that sometimes she is culturally in over her head, are both believable because of her performance. 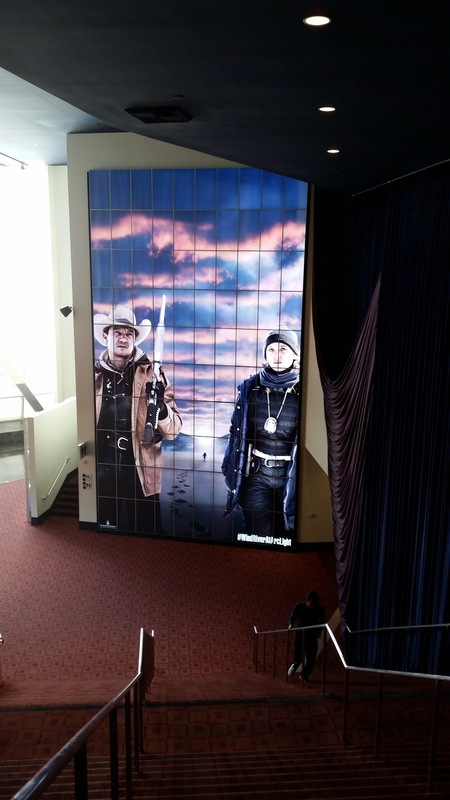 Two Native American actors that have become very familiar over the years also bring some heart and reality to the film. Graham Greene has played police officers before, but his Tribal Officer in this film is low key and world weary, but still has a sense of duty and humor. Gil Birmingham, who starred with Greene in some of the "Twilight" movies plays the distraught father of the woman who died. His role is not as significant as his co-starring turn in "Hell or High Water", but he has some very solid moments that also tell us about the frustrations of the culture these characters inhabit.